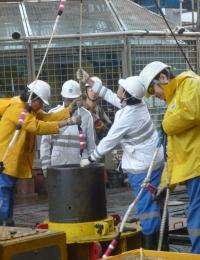 On July 16, 2012, Chikyu, operations in the second part of the Integrated Ocean Drilling Program (IODP) Japan Trench Fast Drilling Project (JFAST), achieved another objective by installing temperature sensors across the plate boundary where the science team infers the fault slipped during the 2011 Tohoku Earthquake. The scientists got on board the state-of-the-art scientific drilling vessel Chikyu to meet the challenge of measuring temperature directly from the fault zone. The recorded data should help to understand why such large earthquake slip occurred that generated the devastating Tsunami. This is the first time to measure the frictional heat produced by the fault slip of a great subduction zone earthquake, remarked the Japan Agency for Marine-Earth Science and Technology (JAMSTEC) in their press release about completion of the project issued on July 19, 2012. JAMSTEC is the IODP Implementing Organization for Japan that operates the Chikyu. "During the original expedition last April and May, it seemed at almost every step of the way there was some problem or delay," said Prof. James Mori of Kyoto University, Co-Chief Scientist who led this expedition. 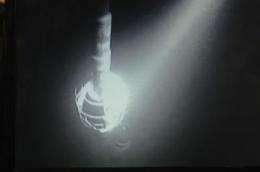 There were many steps in the deployment of the observatory; preparation of the underwater camera system, running the long pipe to the ocean floor, setting the wellhead, borehole re-entries, underwater instrument releases, borehole drilling, casing installation and temperature instrument programming. "There were difficult technical aspects for the borehole which reached 855 meters below the seafloor in nearly 7000 meters of water. Chikyu, or any other research ship, has never drilled in such deep water, so there were many engineering challenges," Mori continued. JFAST had two main objectives: to collect geological samples to analyze the physical properties of the fault zone and to measure the temperature near the fault to understand the frictional heat produced by fault slip. During the original expedition of over 50 days, Chikyu drilled two boreholes and achieved the first goal to collect geological samples and other geophysical data to analyze the physical properties of the fault zone. The deepest hole set a new record depth for ocean scientific drilling with a total of 7768.5 m measured from the rig floor (7740 m below sea level). However, during that expedition the temperature sensors were not deployed because of many delays caused by technical problems and bad weather. Prof. Frederick Chester of Texas A&M University, geologist and the other Co-Chief Scientist of the project continues that "fault temperature rises rapidly from frictional heat when earthquakes occur but the heat is absorbed by the surrounding strata over a period of several years, and the temperature returns to the original level, so it is vital to measure the temperature as soon as possible after the earthquake." "We were very fortunate on this project that additional expedition days were provided so that we had the opportunity to try again for the observatory deployment," Mori expressed. In fact, this really was the last chance to place the observatory before the temperature signal would become too small to measure. "Detailed knowledge of the actual drilling conditions and instrument performance, which were gained by drilling engineers from experience during the first expedition, contributed immensely to the success the second time," he continued in presenting an overview of the projects. JFAST II took place onboard the scientific drilling vessel Chikyu, and the expedition was completed on July 19. "The deployment of the temperature sensors has been an exciting technical accomplishment, but the real scientific results come when we see the recorded data," Mori added. "We already have a plan to return to the site this autumn or later to extract the instrument string from the borehole, using a remotely operated vehicle (ROV) in the very deep water." Recovery of the instrument string will be the final major challenge in an attempt to better understand the dynamics of seismic slip. The IODP scientists represent wide-ranging disciplines of the Earth and life science, including geology, geochemistry, paleomagnetism, sedimentology, geophysics and microbiology, and are contributing their expertise so that this research may yield new understanding of the mechanisms of the huge earthquake and tsunami that devastated eastern Japan in 2011.